He's a great guy with a big heart, who is passionate that Muay Chaiya should be taught in the traditional manner as he was taught not only by Kruu Tong, but by the real master of Muay Thai Ajarn Kaet Siriapai (please check this blog for a more detailed account). As a sidenote, I do consider Ajarn Lek to be a master in the classical sense, as he not only teaches Muay Thai, but several other traditional Thai arts and so he is a well balanced and rounded individual, and not just someone who teaches fighting for a living! This may also account for Baan Chang Thai's lack of exposure, and difficulty to find. 4) THERE IS NO GROUNDWORK which is emphasized by the hard floor that we train on! Muay Chaiya is primarily a striking art, and this is what it is good for. 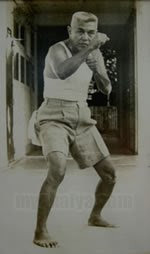 There is a lot of hand work, and a good Chaiya fighter is just as good with his fists as he is with his feet. 5) Whilst the teaching is very rigid on technique, Ajarn Lek considers that once you have the Chaiya 'heart' then a lot of the details become second nature, and true expression of the style can begin. The ambiance at Baan Chang Thai, is very friendly, and anyone is welcome to come and learn. They even have an open door policy, so that people (as long as they are respectful etc) can come and train with the equipment at any time for free. Unfortunately there are only a few people at Baan Chang Thai who train enough and have the experience to be able to really compete or fight professionally, but there are many capable students. People of different styles are welcome to come, and the students are always keen to learn details an insights from other kinds of Martial Arts. Likewise, many types of people come and learn, from young to old, both men and women, who want to learn Muay Thai, but are put off by the image of modern Muay Thai camps. Great news, Kru Lek's (Baan Chang Thai) new website is pretty much finished (there's a few links that are still not working) so get on over and check it out at www.samkhum.com. The bad news, it's only in Thai so I'm afraid for most of you it won't make a lot of sense. I'm finishing up a few things of my own, and then I'll be translating it into english, so stay tuned. But for now, there are plenty of pictures and a few videos to check out. For pictures of Muay Chaiya follow this link. A video of one of the choreographed sequences that Kru Aof and K.Tae perform (Muay Chaiya vs Knife). There's lots of information on this site, but for now, you'll have to get a Thai friend to translate for you. I'll let you know when it's available in English. As a side note, check out the video on the home page. This features footage of Kru Lek and Tae Chaiya 'playing' at a recent visit they made to Spain. They playing the Dopp Hoo game (slap ears) which is one of the basic training methods that we use for reactions and timing. I spoke to Ajarn Lek shortly after they got back from Spain, and he told me that his body was soar all over. After seeing this footage, I can understand why! The dopp hoo game is fun, but if you play it hard and fast, then it can really hurt... not the person blocking, but the person hitting! K.Tae is very good at this, and when you go full force, you will come away with your forearms fully bruised, and your thighs smarting (trust me I know). But it's all good fun, and a great way of training. 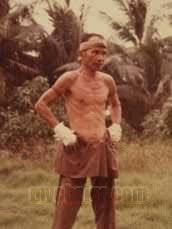 If anyone was wondering where I got the idea for the name of this blog from, then you should check out mymuaythai.com. It's a great blog which keeps up to date with the main events of the Muay Thai world, and has a good following of great fighters. It's creator Nopstar recently asked me to write a post for the site on Muay Chaiya, and I was happy to oblige. 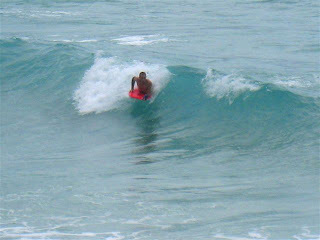 So surf on over to mymuaythai.com and check it out! Before leaving Bangkok for Phuket, I decided to throw a leaving party at Baan Chang Thai to thank Ajarn Lek and students for taking me in and making me feel like part of their family. It was also a chance for me to invite some of my friends from outside of Muay Thai Chaiya and introduce them to the Baan Chang Thai crew. Food aplenty and more than enough drink to go around, we had a fun night. Big screen Tekken, Twister and a dog bite (sorry Rikky!) ensured a very interesting evening! Thanks to all for coming, and I'll be seeing you soon!